Presently, J-Carter is one of the fiercest rappers in rap music’s underground scene. As the inventor of benevolent swag, Carter’s music comes with its own theme and jewels for people of all walks of life. Recently, I had the honor of reviewing his newest release I’m Still Here and was also able to discuss a few things with the emcee that brandishes an impeccable flow. I think you will enjoy the conversation. Warlock Asylum: I would like to thank you for taking time out of your busy schedule to share some of your insights as an artist and on life in general. It is certainly an honor having you as a guest on the News Page. However, for some of our readers who may not be familiar with your work, please introduce yourself. Who is J-Carter? 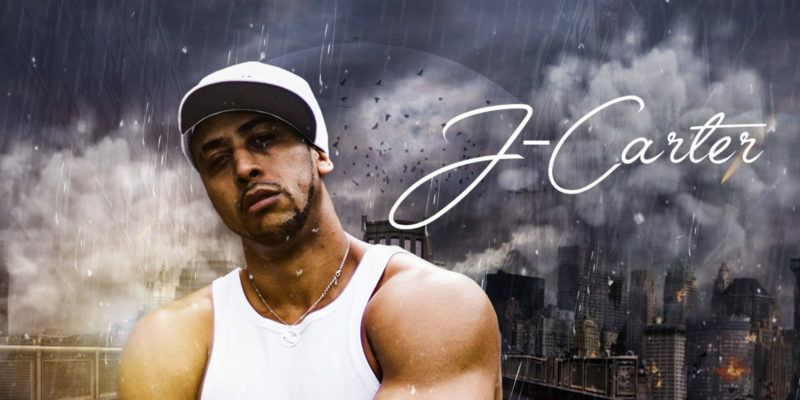 J-Carter: J-Carter is a lyricist straight from Jersey who brings that old school flow to the game, but looking to change the game through a different outlook in hip-hop and definitive lyrics no one has heard before. Also, to elevate the minds of all people in our society so we can grow together mentally and spiritually. Warlock Asylum: What inspired you to get involved in music? J-Carter: Well, during the greatest creative period in hip-hop. I was in the classroom bored to death, and it just hit me to start writing lyrics. Right out of the blue! It was like I was preordained to be an M.C. Then I started perfecting my craft to putting rhymes to beats to perfect the flow, and BAM! Here I am! Warlock Asylum: What obstacles did you have to overcome as an artist in order to make music one of your priorities in life? J-Carter: Well I put off music due to a lot of circumstances that engulfed my life at different times. My mother died when I was still in high school, I got married at a very, very, young age and had kids at a very young age. So, I had a lot of responsibility on my shoulders that took me away from all the things I wanted to do musically. Now that I took care of the things that mattered the most, as in family, it’s my time to take care of the world through my music! Warlock Asylum: 2018 is certainly turning out to be a huge year for you as a rap artist. You’ve released two albums, Time To Shine, and more recently I’m Still Here. Can you tell us a little about the development of these recordings and what was your motivation in getting them out into the world? J-Carter: I’ve been working on both of these albums for nearly three years! If you wanna do something, you gotta do it right! It was very difficult to find the right beats to match the right song and the right people to collab with to make not just any music, but GREAT music! What motivated me to actually come out of the wilderness into the world of music is all the bad music being put out! Everybody wants to be a rapper and that’s cool, but there’s a lot that goes into being a GREAT rapper! I’m here to show the world and those trying to be great rappers how I do it and remind them that it’s hard work involved. Warlock Asylum: Out of all the songs that you have written, do you have any specific rap tunes that you cherish above the others? J-Carter: Wow! That’s a tough question because as an artist, everything you write is GREAT! At least to the one writing it. But, one that I’m really proud of and was very difficult to put together to make people understand where you are coming from is I Ain’t Yo N*gga. This song is so powerful not only because the word is so prevalent in hip-hop culture today where almost every rapper uses the word in some form or another, but this song is the first of its kind! An M.C who actually is against using the word and obliterating it’s usage out of existence so that society can become more united within itself! I have had people say I have offended them because of my stance towards the word. Well if I have offended you, maybe it’s because you’re one of the ones in favor of keeping this word alive. But this word offends people of all race and ethnic groups. Warlock Asylum: How did your childhood affect some of the decisions you’ve made thus far? J-Carter: My childhood was similar to everyone else living in the same demographics. I grew up poor. My father wasn’t really around. In fact, every one of my friends I grew up with didn’t have fathers. We were the fatherless gang, lol! But I believe that had a positive effect on each of us. Because now every one of us are outstanding fathers! Those tough times, made me a better person, a better man, and taught me never to make excuses in life just because your back is against the wall. Life is not about what you go through! It’s about what you do despite the things you go through! Warlock Asylum: How has music changed your relationships with family and friends? J-Carter: Most of my family and friends never even knew I made music! I always kept it to myself because I felt no one wants to listen to this! Now, I have my family involved in all aspects of my music; from doing hooks, to rating my music when I make something new. My wife sings some of my hooks. My kids still don’t look at me as an artist- to them I’m Dad, not an M.C that can tear a beat apart lyrically! Warlock Asylum: What can we expect to hear about J-Carter in the future? J-Carter: Oh my goodness! I have so much to give the world lyrically and musically. It’s not even funny! I wish there was a way to hook the internet to my brain so I can disperse all of this heat I have stored in my mind for the world to hear! My goal is to put an album out every 6-7 months! I want people to talk about my music like they talk about 2-Pac, Nas, KRS, Public enemy, and Common. These artists are talked about because they lyrically made a difference. I’m here to make a difference! If I have offended you or upset you, or made you feel good, or made you think differently about the world and what you see in it, I have done my duty. *On behalf of Warlock Asylum International News, I extend my deepest appreciation for your powerful words and insights about life. Your wisdom is something that many of our subscribers will take to heart. I would to personally wish you all the best in your spiritual and earthly endeavors. Peace!